For new credit card users or those looking to build their credit, the idea of taking out a “free” line of credit can be exciting. 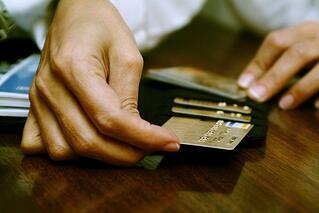 But if you aren’t careful, credit cards can be potentially hazardous to your financial health. In fact, maintaining a healthy credit score with one or more credit cards can also be difficult for more experienced credit card users. If you’ve recently been thinking about applying for a credit card or you’re wondering if it’s time to get rid of your current credit cards, there are a few important risks to be aware of. While there can be many benefits that come along with responsibly using credit cards, for many people the cons definitely outweigh the pros. However, if you can learn to develop better credit card habits, you'll have a better chance avoiding some of the most common financial mistakes. How Can Credit Card Use Be Harmful to Your Financial Health? Some credit card companies send out pre-approval notices for credit cards that offer a 0% fixed-rate but once you've completed the credit application, they'll end up sending out a different card altogether. Creditors often include a “bait and switch” option in the fine print of the credit agreement that says you will agree to take whichever credit card they decide to send to you, even if it is at a much higher interest rate than the card you initially applied for. Receiving an alternate card to the one you were interested in initially can come with many financial consequences. Avoid making this common credit card mistake by paying close attention to the fine print on any credit card application you are considering. Financial experts warn that people are much more likely to overspend when they use credit cards rather than any other form of payment. In fact, certain studies suggest that consumers spend twice as much using credit cards than they do when using cash. Credit cards make spending easy and convenient, which is ideal for avoiding the typical “pain” that you may feel when spending cash. Prevent overspending with your credit card by setting a spending limit, even if it is well below your credit card limit. Set your spending limit based on what you can afford to pay each month and be careful not to overspend in order to live a lifestyle that is beyond your means. While most people are concerned about maintaining a good credit score as they look to obtain a car loan or get approved for a mortgage, your credit score actually determines much more than loan interest rates. Your credit score has an effect on how much you pay for insurance coverage, where you can rent, which jobs you are eligible for and much more. As you accumulate credit card debt over time and lower your credit rating, you will inevitably end up paying more money for many everyday things than those who maintain a healthy credit score. Build and protect your credit score by paying your credit card bills on time and keeping your total balance below 30 percent of your overall credit limit. Additionally, minimizing the amount of credit card applications or inquiries made in a calendar year can help to keep your score higher. Keeping up with your minimum payments will help to keep your credit account in good standing and avoid late fees but in the long run, simply making your minimum payments is only good for creating a false sense of security. In fact, by making such a small payment amount each month, you’ll spend much more time paying off your balance and end up paying more interest. If you can’t pay off your total balance, pay more than the minimum as often as possible. This will help to reduce your total balance much more quickly and help you to avoid paying more in interest as time goes by. Even if you feel like you’re on track with your credit card payments and you’ve been maintaining a total balance of 30 percent of your overall credit limit, hidden rules and fees can have an effect on your financial health. The fine print on most credit card agreements tends to favor your creditors, so paying attention to those “hidden” terms is always in your best interest before opening a new line of credit. Whenever you borrow money you create debt. And the more that you borrow without repaying, the deeper into debt you’ll fall. If you are living with a huge amount of debt following you around it can cause a great deal of financial strain and lead to other issues like stress, depression and other serious health problems. Once you find yourself in debt, reaching your financial goals is much more difficult. A large amount of debt can make it impossible to save and increase your chances of filing for bankruptcy. Beware of the early warning signs that you are headed for credit card debt and stop using your credit cards as soon as possible. If you are having a hard time getting ahead of your credit card debt and think that filing for bankruptcy may be your best option, our experienced New Jersey bankruptcy attorneys may be able to help. With a knowledgeable and skilled attorney by your side, you can put a stop to harassing phone calls from creditors and take control of your finances once again. Want more information on how to avoid making common financial mistakes? If you're interested in learning more about controlling your spending or you have questions about Chapter 7 and Chapter 13 bankruptcy, visit the team at Scura online today to schedule a free initial consultation.